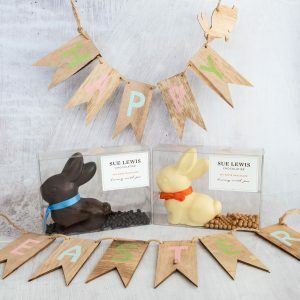 Perth’s Most Eggsellent Easter Gifting Solutions! When it comes to Easter gifting, many of us cringe at the thought of brightly coloured tin foil covered bunnies. I mean, how could we not? They are everywhere in the supermarket aisles before Santa has even kicked off his boots. And just like the furry real life versions, they multiply in size and quantity, the closer we get to Easter. It’s enough to make you sick, literally! Sweet, mass produced chocolate, the kind that does nothing for your hips or teeth and makes the kiddies hyper. No one wants that. We’ve all seen or felt the aftermath of an Easter chocolate overload. Not pretty. Now, not all chocolate is made equal. In fact, some chocolate may actually be good for you! Hallelujah dark chocolate. 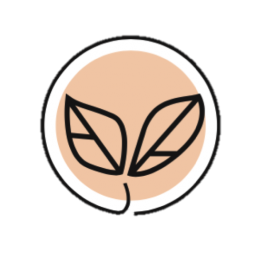 Here at The Gifting Pot, we are all about quality, not quantity. We do artisan, not artificial. And we love sourcing and connecting with our suppliers. So, this Easter we have collaborated with super talented Perth Chocolatier, Sue Lewis and Dessert Stylist Nikki Bird to bring you the very best of effortless, eggsellent gifting! Hand crafted tasty Easter treats that look (almost) too good to eat, have been selected for our Easter Gifting Pots, so you can skip the supermarket nasties. Our Easter Gifting Pots and Products have been created with you in mind. Buy them as a separate Easter gift or team them up with some of our other products to create your own Gifting Pot. Either way, these artisan made chocolate gifts are perfect for corporate gifting, client thank you’s or rewarding staff. Your family and besties will be saying you’re an Easter legend with these Easter Gifting Pot ideas. Shop Easter Gifts now before they hop away! Easter Indulgence is a chocolate lovers delight, including our favourite Easter treats from Dessert Stylist Nikkisweets and Chocolatier Sue Lewis. 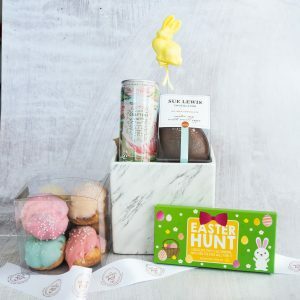 Available in Perth only, the Easter Indulgence Gift Pot includes a 100g Sue Lewis luxury egg, 7 piece mixed flavoured custard puff box from Nikkisweets, 100g “Easter Hunt” milk chocolater and delicate, fruity Rosé. The best part of the Easter Bunny, has to be the bum. How cute are these bottoms! Available to gift as a single bum or a three pack, these Bunny Bums are 40 grams of milk, dark or dulcey chocolate, perfect for those who only want a little bit of Easter Chocolate goodness. Chocolate addicts this ones for you! Our favourite Easter Gifting Pot, sure to please any chocolate lover. 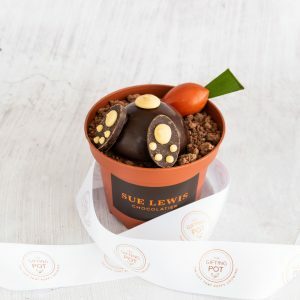 Crafted with love through collaboration with Perth chocolatier Sue Lewis, these pots are filled with quality chocolate buttons, chocolate soil, bunny bum and carrot. Available in milk or dark chocolate. 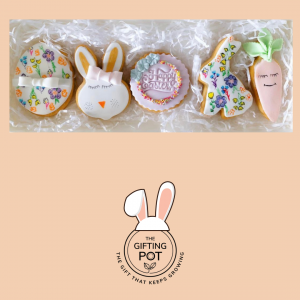 Ever since these bunnies arrived at The Gifting Pot HQ, they’ve been nothing but mischievous. Their multiplying ways and extraordinary amount of droppings have been making such a mess! We’d love you to give these Easter bunnies a good home. They come in white, milk and dark chocolate and taste delicious! The sweetest cookies in town! How gorgeous are these Easter cookies handcrafted by Nikkisweets. 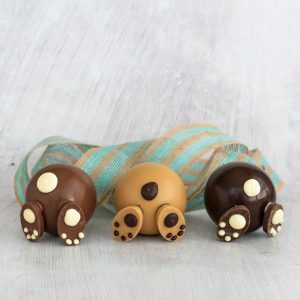 Delicious, sweet and cute, they will be a hit treat for those that don’t do chocolate. 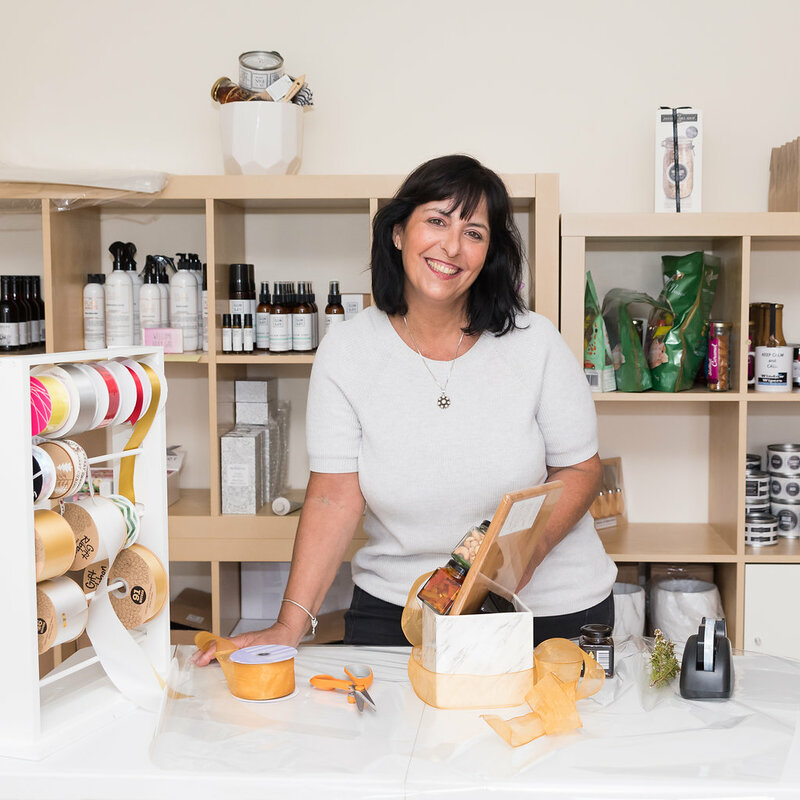 Lyn Uniewicz is the founder of The Gifting Pot and is Perth’s most loved Gifting Queen. Lyn loves connecting with people and sourcing from local artisans to create effortless memorable gifts for you. 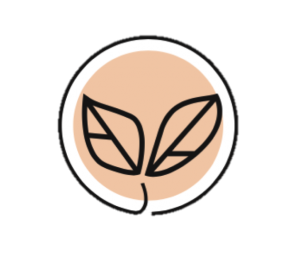 The gift that keeps on growing; all Gifting Pots come with a packet of our signature seeds. 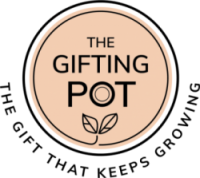 Follow The Gifting Pot on all the usual fun social spots. 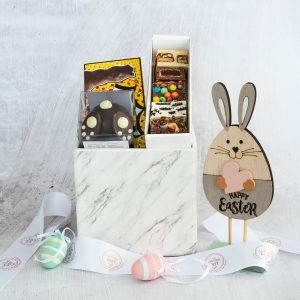 This entry was posted in Corporate Gifts, Easter Gifts, Gifting Solutions, Perth Gifts, Real Estate Gifts, Small Business Gifts on April 8, 2019 by Lyn Uniewicz. It’s Christmas in no time again and I don’t know about you, but I have certainly had years in the past where I have struggled to find just the right gift for someone important in my life. 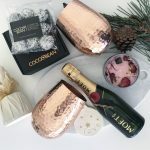 It’s one of the many reasons for launching The Gifting Pot – to provide more effortless gifting solutions to the standard old boxed or basket style gift hampers you see shared around all over the place at this time of year. I’m excited to be receiving advanced orders from my corporate and business clients to pass onto their valued clients. There’s nothing quite like having someone say “you matter” with a quality gift filled with things you can actually use and often eat. 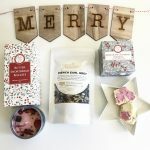 I’ve had great fun sourcing the products to go into each of our Christmas 2018 Gift Pot range and can’t wait to hear from you and your gift recipient once your Gifting Pot Christmas 2018 gift pot has been received. Click the button below to see our Christmas range and be sure to get your orders in early so you don’t miss out on the Gift Pot you’d like to share with someone. 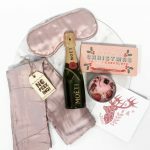 Christmas 2018 Gift Solutions Are Here! 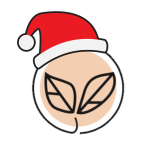 To ensure delivery in time for Christmas, all orders for the festive season are due by close of business Wednesday 19th December 2018. This date is for Perth metro orders only. If you have something to deliver further afield, please contact Lyn to chat about the right solution. 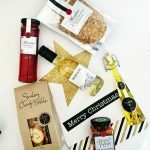 This entry was posted in Christmas 2018, Corporate Gifts, Gifting Solutions, Perth Gifts, Real Estate Gifts, Small Business Gifts on October 30, 2018 by editor.